Here is a simple DIY Carpet Ink Stain Removal Tip in Birmingham AL 35242. Do you have a bad ink, dye or color stain in your carpet? If yes, then you’ve come to the right place to try an inexpensive method. For carpet ink stain removal, all it takes are a few simple household items and you should be well on your way to cleaner carpets. 1. Moisten the stained area well with the hydrogen peroxide (try in an inconspicuous spot first, as hydrogen peroxide can remove the actual color of some carpet fibers). 2. Lay the moist wash cloth over the stained area. 3. Apply the heated clothing iron on top of the moist wash cloth for several seconds allowing the stain to absorb into the wash cloth. Monitor the entire process closely allowing more or less time with the heated iron as needed. Continue these steps repeatedly across the entire stained area until reaching desired results. Be careful as you can easily burn or melt your carpet fibers if you leave the iron down too long. Still struggling with the carpet stain? Let HEAVEN’S BEST CARPET & RUG CLEANERS of BIRMINGHAM help you achieve the ultimate desired results with their professional carpet stain removal system. Contact us today at (205) 618-9150 for our Current Carpet Cleaning Specials. If you don’t have time to try the DIY Carpet Ink Stain Removal Tip for Birmingham AL 35242, let Heaven’s Best of Birmingham take care of the stain for you. 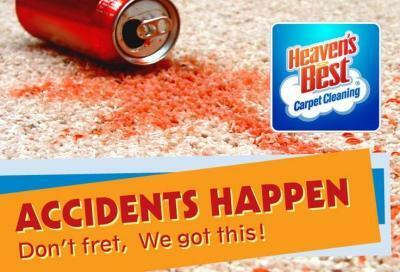 Request a Carpet Cleaning with Stain Removal!